As you guys are aware, I’m kind of a fan of all things Cajun. Even though I’ve never stepped foot in Cajun/Creole territory in my life – I can’t help but connect to the people, and their quirky ways. From the characters in stories that I’ve read, to the television shows I watch, to some of my favorite foods – I just can’t get enough. My mother in law lived just outside of Alexandria for a few years, and while it wasn’t technically Cajun country, she still found many of the traditions there. One of them was King Cake. She came to visit us around Mardi Gras time a couple of years ago, and brought a King Cake through airport security with her. This woman deserves a medal, no? When we cut into it to enjoy a piece, I discovered it was very similar to a cinnamon roll. Yeasty bread, that’s been rolled with sweet filling composed of cinnamon-sugar and cream cheese. Then of course there’s the plastic baby that’s tucked inside. 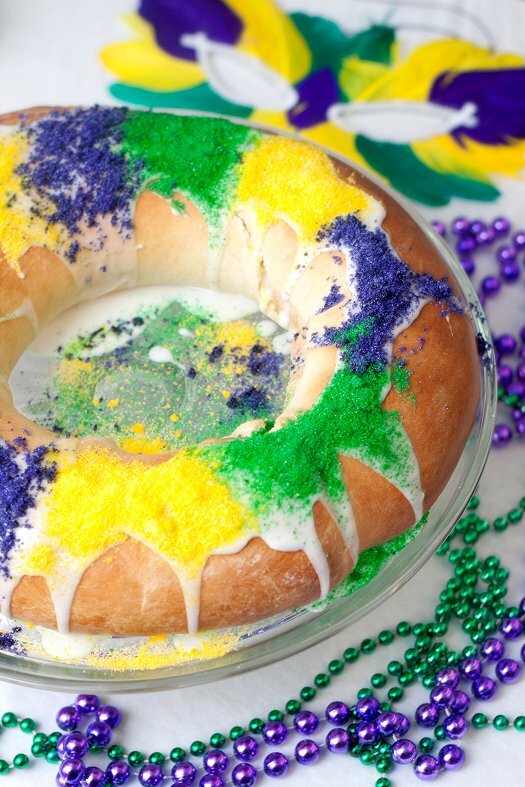 If you’re lucky enough to find it, that means you’re cooking the next King Cake! So, I’ve been baking one ever since. Jon actually found the baby in this cake that I baked for photos, but I’m not holding my breath for him to put on his baking mitts and apron. I found my tiny plastic babies in the cake decorating/baby shower aisle at Walmart, but really any trinket will work. Then the cake is topped with a glaze and a festive, colorful dusting of sugar in the colors of Mardi Gras. I just went ahead and made my own too. At $4 a jar for fancy decorating sugar, granulated sugar + food coloring was sounding pretty good to me! Andrew loves to help me decorate with the sugar, and I love any opportunity that he can help me in the kitchen! This one will definitely be a tradition in our house for as long as my hands can roll up some dough. We love it, and it’s so special to be able to bring a tradition from the bayous of Louisiana here to the marshes of coastal Maryland. Laissez les bon temps rouler! Add water and 1 Tbsp sugar to the bowl of your stand mixer. Sprinkle yeast over top and let stand for 5 minutes, until yeast bubbles and becomes active. Add melted butter, egg, egg yolk, remaining sugar, 3 cups flour, and salt, and then turn the mixer to low. Add only enough extra flour to get the dough to clean the sides of the bowl but not come completely off the bottom – it should be only slightly sticky when you touch it. Transfer the dough to a lightly oiled bowl, cover, and let rise in a warm place until doubled, about 1 hour. While dough is rising, make the filling. Place cream cheese, sugar, egg yolk, vanilla and cinnamon in a food processor fitted with a metal blade. Pulse a few times until the filling is thoroughly combined and smooth. Set aside. Preheat oven to 375. Turn dough out onto a lightly floured work surface and knead a few times. Stretch to a rectangle about 18×12 and brush with 2 Tbsp melted butter, leaving top 1-inch dry. Using a small off-set spatula, spread the cream cheese filling over the dough evenly, leaving the top 1-inch dry. Starting with the long side of the dough closest to you, roll jelly-roll style, pinching the last inch of the dough onto the roll and placing seam-down on a cookie-sheet lined with parchment paper or a Silpat. Pinch ends together to form a ring. Place in oven, and bake for about 30 minutes, until nicely browned and domed. Remove from oven and let cool 10 minutes. Then transfer to a wire rack to cool completely. To make the glaze, whisk powdered sugar, vanilla, and gradually add the water until you get a smooth and thick but scoopable glaze. Spoon glaze onto the top of the cooled cake, then decorate with colored sugar. If baking the cake in advance, wait to glaze and decorate until an hour or so before serving. Otherwise, you’ll get bleeding issues from the colored sugar. Yum! Your King Cake is beautiful. I was born in Cajun territory and I have never actually made one myself. This will be the year and this will be the recipe! Well, he does have this fabulous recipe at his disposal now. How fun! I’ve never had King Cake. I need to rectify that immediately! I have been itching to make a King Cake for years, but ultimately I passed it up for beignets this weekend 🙂 Definitely bookmarking this one for next year! I think we think alike as I just made one, too! They are fun aren’t they?